An award-winning Lancashire Evening Post reporter is to head up a new investigations unit launched by Johnston Press. Aasma Day leads a team comprising journalists from across the regional publisher's titles, including the Sheffield Star's Chris Burn and Ruby Kitchen from the Yorkshire Post & the Yorkshire Evening Post. It has launched with a 'Drive for Justice' report about lenient sentences for those convicted of causing death by dangerous driving, and how no-one in the UK has ever received the maximum sentence of 14 years’ imprisonment. The publisher says that as well as carrying out investigations, the unit will have a "campaigning and lobbying role at its heart", and will be launching a petition later this week, calling for tighter sentences and other legal changes. Jeremy Clifford, editor-in-chief at Johnston Press, said: “Investigative journalism – and holding those in authority to account - is at the very core of our business and of the communities we serve. We’ve seen the impact and benefits that campaigns supported by local titles can deliver and the lives that can change. 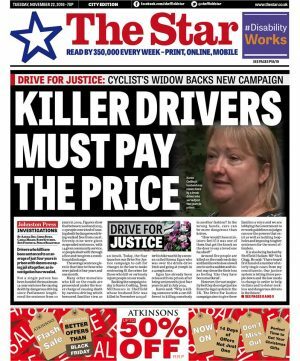 The first investigation launches with a front page and inside content for Johnston Press titles including the Lancashire Evening Post, The Yorkshire Evening Post, the Sheffield Star and the Yorkshire Post.